I LOVE HOLOS!! Do you? What's your favourite holographic polish? oh my GOSH i love this!!!!!!!!!!! i don't have any holo polishes but i've been desperately after China Glaze ZOMG and OPI Original Designer Series for ages. Neeeeeeeeeeeeeed. Holy snap! This is right on gorgeous! I have it too and your pictures really do it justice, they are wonderful! I LOVE this! I can't wait to get it! 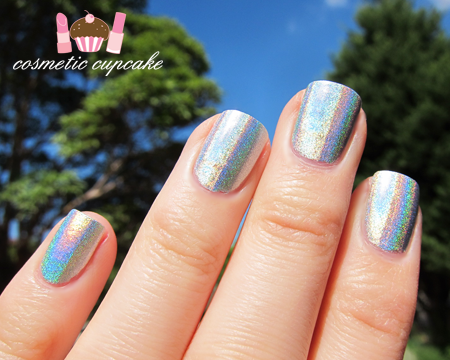 *squeals* My favorite holo is Sally Hansen Crystal Ball. I hope this is similar! I'm dying for this polish for a long time now! I don't have any holos yet, but I'm really looking forward to. Hopefully Essence will be releasing two in March. 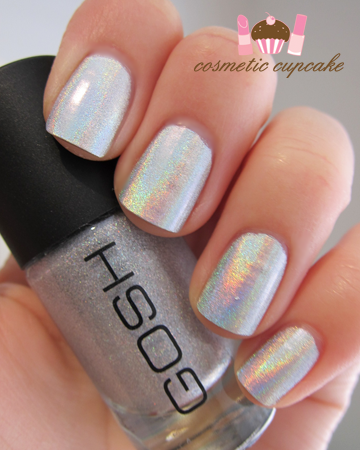 Really want to give holos a try after seeing your swatch, it's blingy beautiful!!! Aaaaaagh it looks totally amazing on ya my lovely! So blinding in the sunshine :) So happy you like it AND that it made its way to ya in one piece! lol! 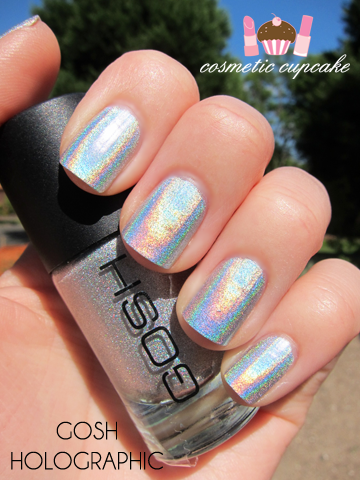 now i want a holo polish!! I want it!!!! LOVE IT!!! OMG this is fantastic, I love love love. And Want! So sick of products not being available in Au! 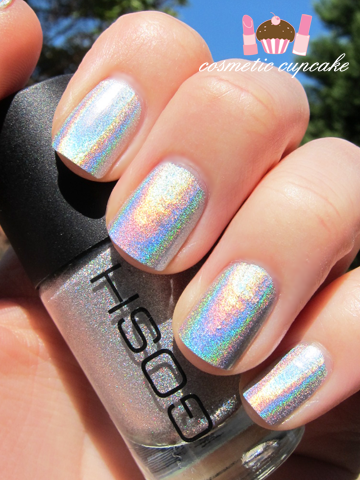 holos are sooo gorgeous aren't they? the china glaze&opi ones are fun to konad with. i wish GOSH nail polishes were easy to find in the states! Oh my lawd that is INSANE!!!! I love it!!!!! That is the coolest nail polish ever!!!!! It looks exactly like the contact I use to cover my school books with. Awesome! my gosh! 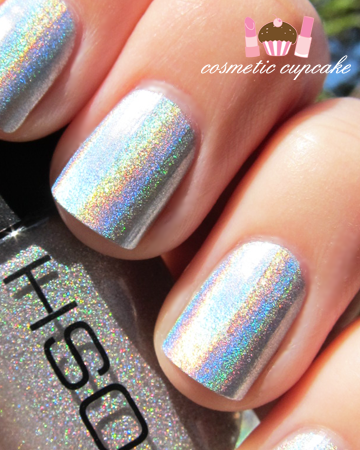 (pun intended) that is a beautiful holo! its so....bright!! i have never seen one like that b4! @Clare: You definitely need to get your hands on some!!!! Holos are so awesome xD I have the OMG collection but desperately need the Designer Series too! @Salla: How do you find the formula? It's sooooo gorgeous, definitely wear it more! @Nahemah: I couldn't agree more! It just dazzles in the sunlight! @Oje Delisi: So am I =) I'm so overjoyed Aysh gave it to me! @Lolaa: Thank you so much! I waited and waited for a beautiful sunny day to try it out and I think it was worth the wait =) I was really surprised that the formula wasn't such a pain too. Which is a great thing! @Lois: Hmmmm I'm not sure! Can you describe it more? @Rachel Marie: Eeeeeeek you will LOVE IT! I hope you get it soon =D We only get the boring Sally Hansen polishes here and we don't have the Dollar tree to hunt for old polishes boo. @serena_nuvola: I'm glad you do because I love it too!! Can you tell I'm so excited to have it in my collection?? @rock-or-not: I am most definitely a very lucky girl. I've been dying for it for ages and thanks to beautiful Aysh I have it!! =) You can win a bottle of it in her giveaway! @Julia Natalia: Thank you so much for following Julia! @Sara-May: I hope you're lucky enough to be able to find a swap buddy for it! It's such an amazing holo =) Sorry to have increased your lemming!!! @marox79: Ooooh I hope they do too so you can try the amazingness that holos are! I'd be really interested to see what colours Essence release. @Ayari/Fifi: Thanks hun =) It's even prettier in real life! @hersheyler: Glad you like it. @Tammie: I wish they were available in Aus so I could get backup bottles!! @Amy: I hope you're able to get a bottle Amy, it's such an amazing polish. @Aysh: I can't thank you enough Aysh!!!! It is even more amazing than I thought it would be =D I nearly blinded myself taking the photos lol. You are such a sweetheart!! @snowbunnytales: I have one piece of advice for you: GET SOME!!!!!! @karo: LOL glad you like it Karo! @Jen: It definitely is my no. 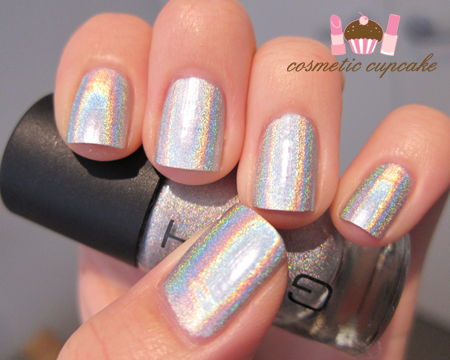 1 holo polish - it's so COOL! @Makeup and Macaroons: Me too hun. Especially cool nail polish like this!! @Kimmi: LOL oh I remember those contact rolls! So very cool. @Joan: I'm very OCD about things lol. It's an absolutely AMAZING holo! I nearly blinded myself when I was driving that day haha.